marsh | Live Healthy S.C. Photographers of all ages and levels of expertise are invited to participate in the annual photography contest sponsored by the S.C. Department of Health and Environmental Control. 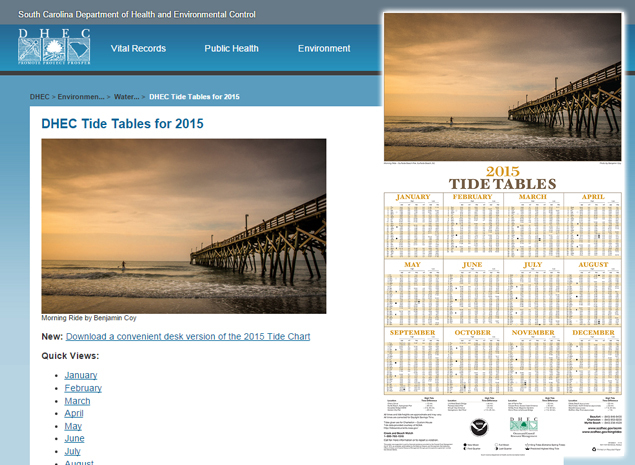 The winning photo will appear on DHEC’s 2016 annual tide table poster, of which over 12,000 copies are produced and distributed. DHEC is looking for coastal South Carolina scenes including marshes, beaches or wildlife. Click here to see the winning photo from last year’s Coastal Photography Contest. The preferred method for entries is via email – dhec_ocrm@dhec.sc.gov. Mailed submissions will not be returned without a self-addressed stamped envelope provided by the contestant. The winner will be announced in November. For questions about the contest, please call (843) 953-9237. This entry was posted in Ocean and Coastal Resource Management and tagged beach, contest, marsh, photography on August 20, 2015 by SC DHEC.